HOSTING A FUNCTION OR EVENT? Employ Me Hospitality Hire Canberra is your hospitality staffing solution for any function or event, at home, at your business or any special occasion. We are focused on providing exceptional hospitality staff to make your next event a success. We strive to offer the best in personalised service for our clients. At Employ Me Hospitality Hire Canberra we believe that our friendly and experienced employees make a difference. That is why we focus on quality training and continually improving our services to our clients. Employ Me Hospitality Hire Canberra is here for you to make YOUR hospitality function a smiling success. Call us now to discuss how we can help you make your next function or event a smiling success! The cooks we hire consists of many year experience in cooking. Employ Me does regular reference checks to confidently hire out the top quality employees to clients. 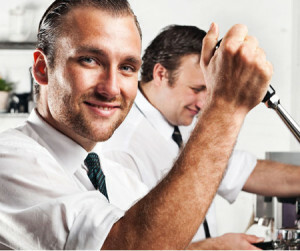 The barista’s we hire out undertake a thorough 1.5 hour coffee course that will allow them gain confidence with maintaining milk texture as well as control of the coffee machine. Responsible Service of Alcohol (RSA) is a strict requirement to become an Employ Me Bar member. It is a illegal for the company to hire out bar staffs that is not certified. Therefore Employ Me collects a copy of all front of house employee’s RSA certificate. Nonetheless, it is not the only requirement needed for bar staffs but skills of a professional waiter or bar staff. We do a thorough 3 plate carry as well as drink service procedure to satisfy all clients with amazing skills! High Corporate Constitutions guests was keen on watching the live Brumbies & Lions game 2013. The guests has consulted the stadium and the night took place in the High Corporate Lounge of Bruce Stadium with Employ Me and Gema Group Wait Staffs. Gema Group seeked over 20 Employ Me Wait Staffs for their assistance and all Employ Me Wait Staffs took on a professional role of providing drinks for all Corporate guests. We demonstrated a proficient role in Alcohol Service, Food Service, Bartendering, and excellent personal skills. We as a team received top feed back from the corporate lounge guests and members. Thousands and Thousands of fellow Australians participate in the Groovin’ the Moove event. More than 20 Employ Me Wait Staffs provided hands on alcohol service for the Groovin’ the Moove crew. The Employ Me waitering squad faced a long night of providing alcoholic drinks to guests and members. Employ Me aims to provide every guest an amazing experience of being served by professional and well dressed wait staffs. Although it was a night where the area was very limited and packed. We still believed that We as a Team – Work as a Team – Smile as a Team! Capital Roasters is a well known Canberra based Catering Company that strives for a smile on each and every guests face by providing top quality food and desserts. we are well known for the large variety menu and all the unbeatable prices. The business was first initiated in 2001, and that would state that the catering experience level has exponentially raised to a whole new level allowing all functioning of the catering to be proficient. We receive many different types of functions ranging from normal birthday parties to weddings. And we believe that at any event, we would like to provide the top quality service for each and every guests. That is why we use Employ Me wait staffs to assist us with all catering service as the dress code is very professional. If any other information is needed, please click on the Capital Roast Logo on the right. As a local based Catering Company with a strong client base in both the corporate and private market, Coyote Catering is often called upon to supple high-end social related functions. These functions need reliable and professional service staff with attention to detail. This is where Employ Me has come into its own as our only choice. Our clients expect a level of catering and with this must come an equal level of service, of which we have found Employ Me to meet all our requirements. We have always had positive feedback from all our clients, from a private function at home to a boardroom lunch or a large scale corporate event. Employ me have always been there to work with my company with quality time and time again. It is important to know that staff will be punctual and be well groomed in a way that we see fit for our clients. The standard dress code offered by Employ Me gives me confidence in knowing that staff will meet all of my expectations each and every time. If any other information is needed, please click on the Coyote Catering Logo on the right. Established in 2013 and delivering a high quality option to the Canberra market, we were awarded the “Savour Australia, ACT Corporate Caterer of the Year of 2013′ upon our first year entering the awards programme and pride ourselves on having the flexibility to deliver exactly the style of event catering that our clients require. At TOPGUN CATERING we only employ staff that share our passion for delivering high end catering and customer service and that’s where Employ Me comes in. As a company we cater for a wide range events from corporate dinners and broadroom lunches through to weddings and canapé events, often with guests numbering in the hundreds. Employ Me allows us access to a large number of professionally trained hospitality staff with just an email, so we never have to worry about staffing, no matter how large the function or event is. With Employ Me on our speed dial, the sky is the limit. 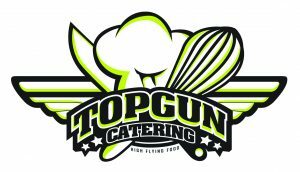 If any other information is needed, please click on the Topgun Catering Logo on the right.